The Road Warriors of Pungo Andongo could be the name of a post-apocalyptic Hollywood movie. 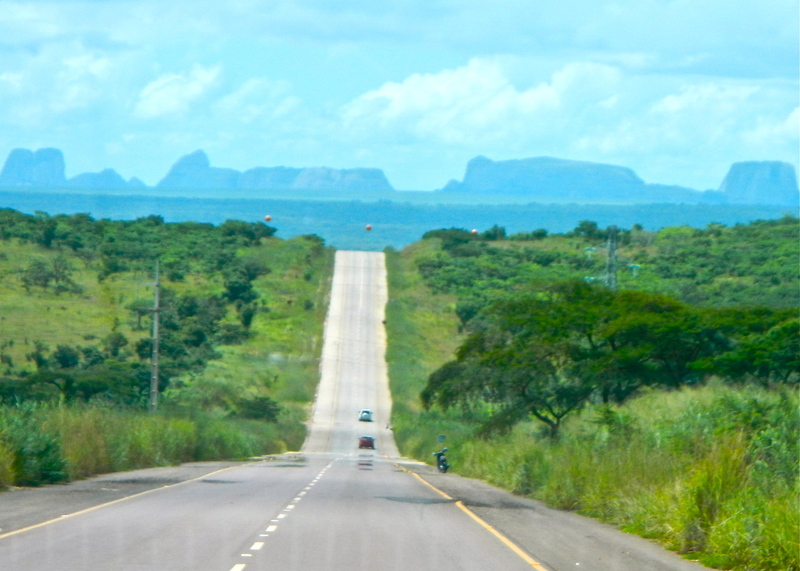 Instead, it was just us – four expats in the back of two Land Cruisers, flying down a remote Angolan road, swerving around potholes, and dodging more goats than I have seen in my lifetime. In short, it was just a typical weekend for us, since moving to Luanda. Our weekend started out innocently enough. 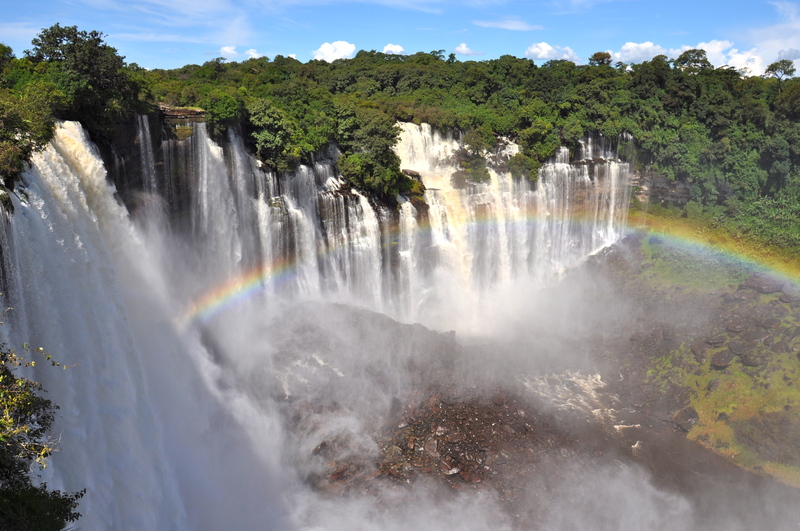 At the invitation of our lovely friends, Mr. & Mrs. G, we planned to travel roughly six hours east of Luanda to the province of Malanje, where we would find the breathtaking Kalandula Falls and the Piedras Negras of Pungo Andongo (otherwise known as the Black Rocks). Mr. G’s company requires them to have a second vehicle (with driver and guard) on every out of town trip, so we were lucky enough to be asked along to fill the empty back seat of their second car. They picked us up bright and early Saturday morning and we began the long trek east. 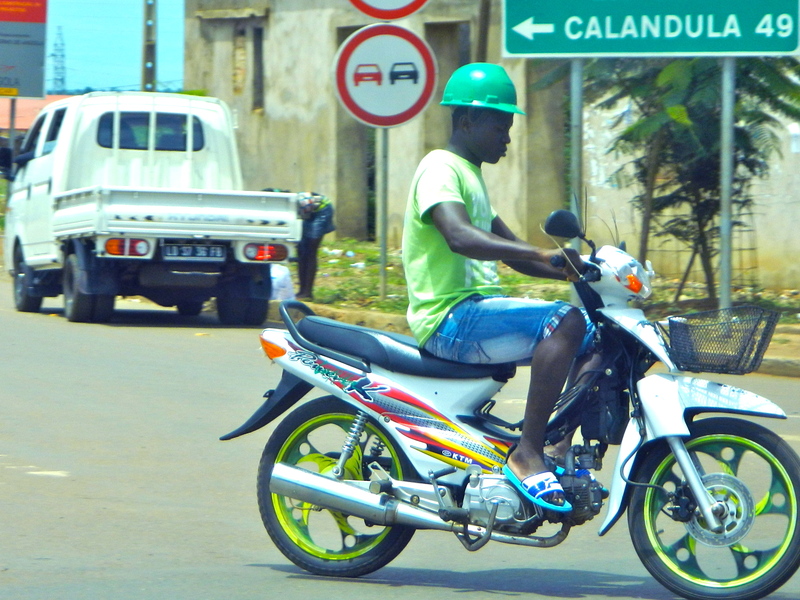 The first hour or so was the usual obstacle course through Luanda’s ever-present traffic, which rivals that of any city in the world – only with a deadly twist. Too many cars, not enough roads, few traffic lights, and no crosswalks for pedestrians create a very dangerous situation. It is very common for people to be hit and killed while attempting to cross the street. Plus, there are no true “lanes” of traffic here. Most drivers take the lane markings and speed limits as merely a suggestion, and generally ignore them. After all, why limit the road to four cars across, when six or seven can fit? 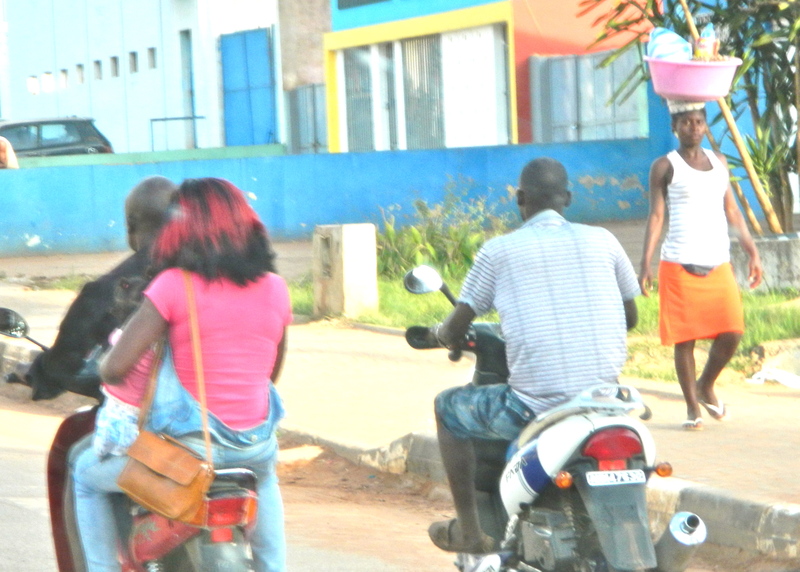 And why slow down for that lady with a basket on her head and a baby on her back? She shouldn’t be there anyway. As a passenger in the back seat, I generally avoid looking out of the front window. My blood pressure is high enough. Once we made it though the log-jam, our drivers picked up speed, gunning the engine to seventy, eighty or more miles per hour, frequently slamming on the brakes to negotiate tire-puncturing potholes, herds of goats, and people making their daily treks to market or a nearby village. All of these potholes were on a new road, mind you. In recent years, many roads have been built cheaply and quickly by Chinese construction companies operating here. Judging by the size of the potholes we saw, this road will be impassable within a year or two. No matter. Someone undoubtedly made a pretty penny off of the project, so it’s all good. We all wondered how, with so many goats wandering freely in the roads, we never saw one get hit by a car – accidentally or intentionally. After all, these people have so little and barbecued goat can be very tasty! Why not just run over a goat and get a free meal? The answer to that is simple: the penalty for hitting a goat is roughly fifty dollars – a near fortune – and the offending driver does not even get to keep the goat! The rule is, the driver must put the fifty dollars under the dead goat for the owner to collect. Supposedly, all of the locals know which goats belong to whom, and so there is no confusion. Gotta love seeing the honor system at work, even in such a difficult environment. While the road left a lot to be desired, the scenery was spectacular: green, lush fields giving way to densely forested mountains. 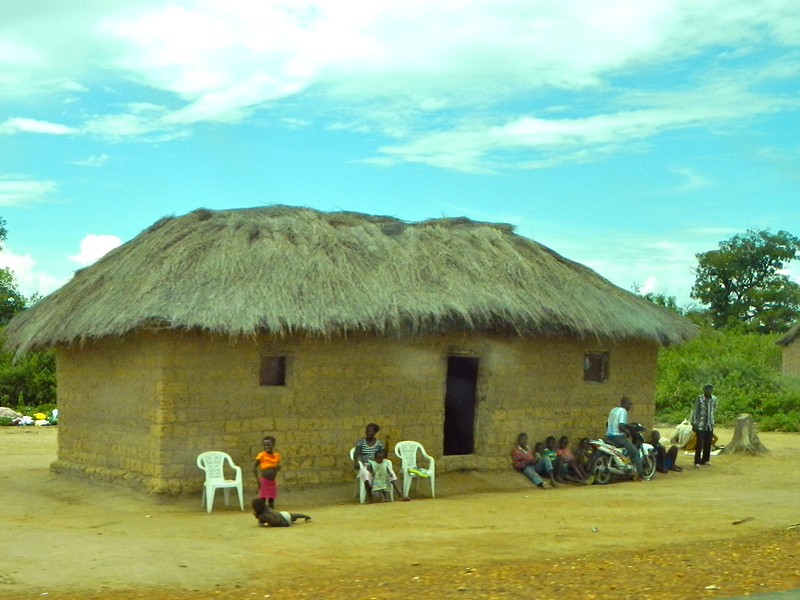 Along the way, we passed village after village, each one made up of thatched-roof homes built from mud bricks. 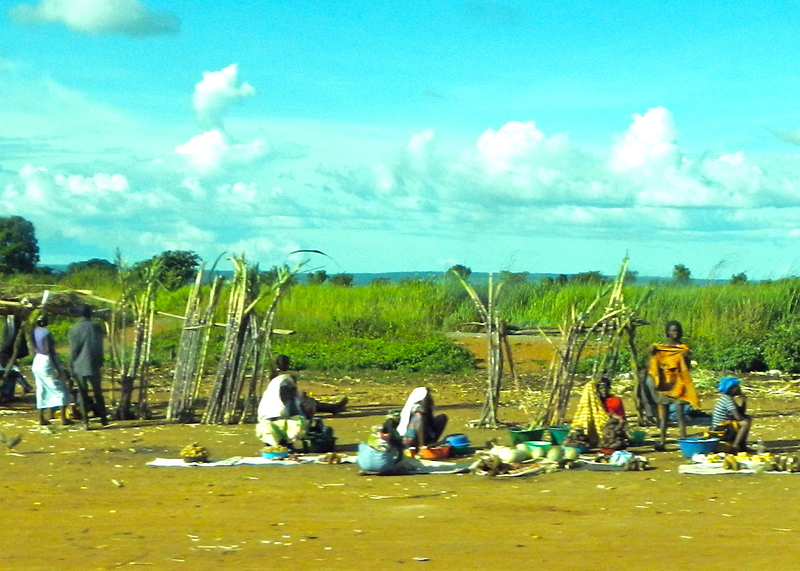 In between the villages were makeshift farmer’s markets, offering buckets of avocados, tomatoes, onions, sugar cane, and cassava, a starchy vegetable that is an Angolan staple. After about three hours, we stopped to stretch our legs at a small, but fairly modern town called Cacuso. The manager of the hotel there welcomed us warmly with coffees and juice, and seemed to enjoy using his excellent English. A hardhat or a helmet? It’s both! A local gal selling homemade yogurt. It was a refreshing and welcome break from the white-knuckle drive, but soon we were on our way. The remaining portion of our drive we travelled on much better roads, mostly built by the Portuguese many years earlier. As pretty as the scenery was, we were anxious to get to Kalandula Falls, reportedly the second largest by volume in Africa. 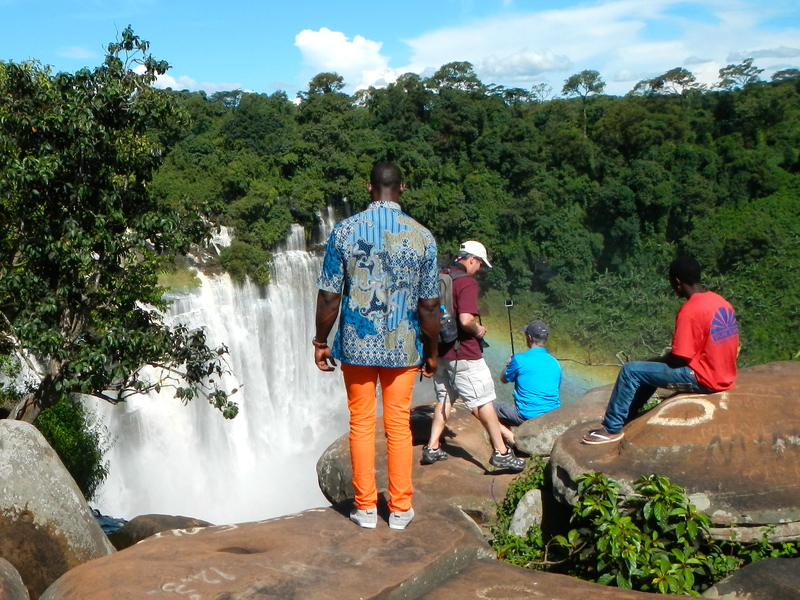 At long last, we pulled into the falls parking area and were immediately approached by some local lads offering their expertise as guides for the hike down to the river. They were very polite and respectful, so we took one of them up on his offer. 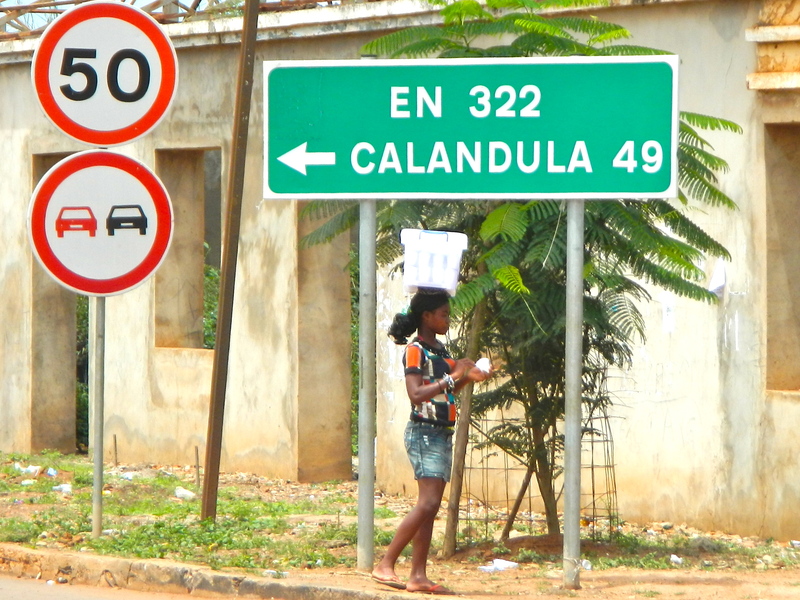 Mrs. G’s Angola guidebook (yes, there is such a thing!) said the trek to the base of the falls would take about twenty minutes to climb down and thirty-five minutes to hike back up. Since it was already after one o’clock, we decided to set up some chairs and eat our lunch before we began. 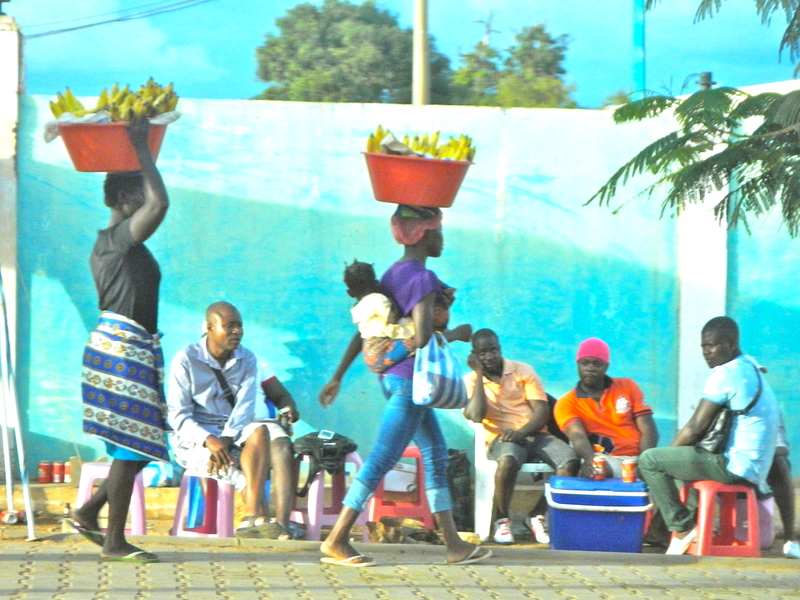 We had always heard that the people outside of Luanda were very different, and this trip has certainly confirmed that. 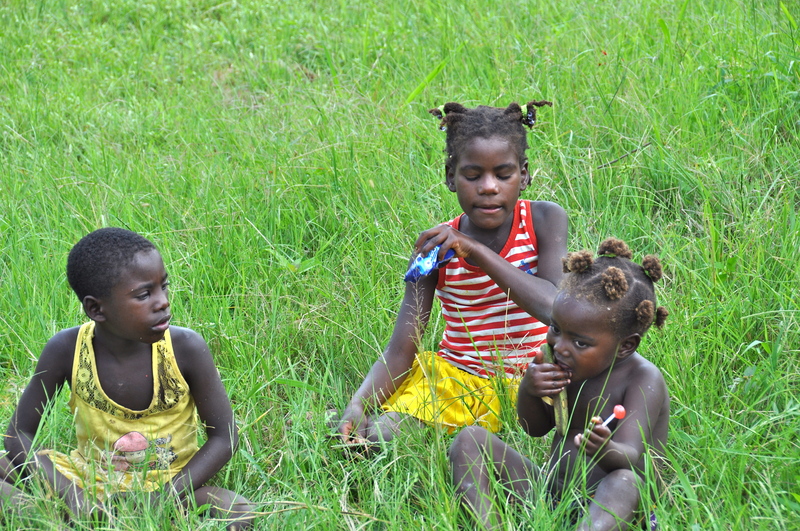 No one approached us for money or food, and we were able to eat in relative peace. Our “guide” even sat patiently while we finished our lunch. Once we were done, we put away our food and chairs and walked to the top of the falls, easily identifiable by the spray seen a short distance away . Clearly, we did not need a guide for this part of the walk, but he led us along anyway. We were amazed to see the magnificent expanse of water, no doubt at a higher than normal volume due to recent rain. And we had ordered up the perfect day to see them, too. We even had a rainbow to welcome us! 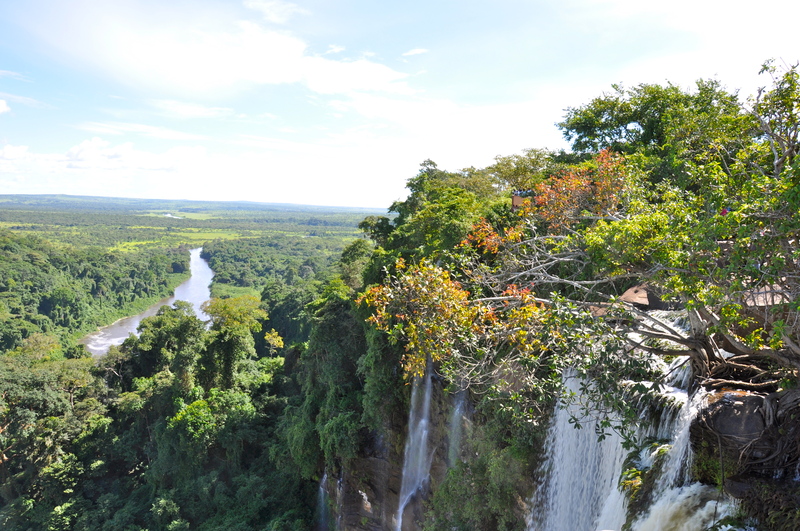 Looking from Kalandula Falls down along the Lucala River. 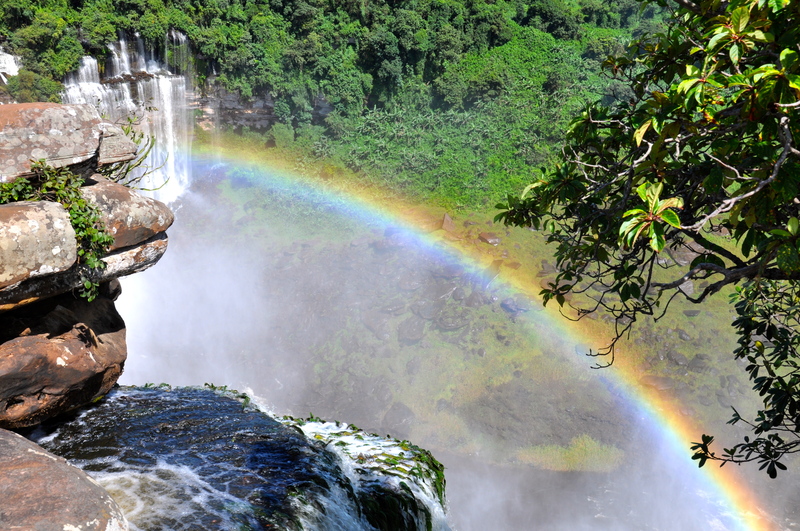 Beautiful rainbow over Kalandula Falls. Our “guide” and guard wait patiently while our hubbies get the perfect shot! Once Mrs. G and I peeked over the falls and down to the river, it was clear this was no twenty minute walk down, despite what the guidebook said. Slick rocks and muddy paths meant a surefire tumble for a klutz like me. There being no medical care for many hours in any direction, we both decided this was not the place to break an ankle. Instead, we found a shady spot with the falls as our view, put our toes in the water, and let our husbands make the climb down. Both guards were itching to go as well, as neither of them had seen the falls before. One of the guards was wearing dress shoes, so Mrs. G nixed the idea, and the poor guy was relegated to sitting with us women. After visiting and enjoying the view for a very long time, there was still no sign of our hubbies. I would have been worried except that they were accompanied by a very capable guard – and an expert guide, of course. Finally, they both showed up, drenched in sweat and breathing heavily. It was – as we had suspected – a very difficult climb down. Both of them agreed that it was very pretty at the bottom, but I was happy to have stayed put. 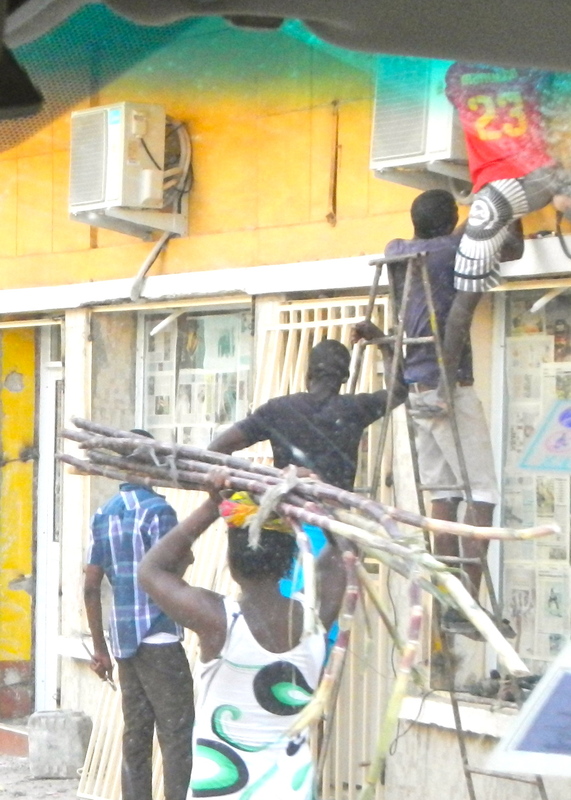 A lady carries sugar cane on her head, while some men attempt to repair an AC unit, balancing precariously on a rickety ladder. No car seats here! The woman in pink is carrying an infant on her lap. Clearly, the lady on the right does not approve! A typical scene in this mostly male-centric society. 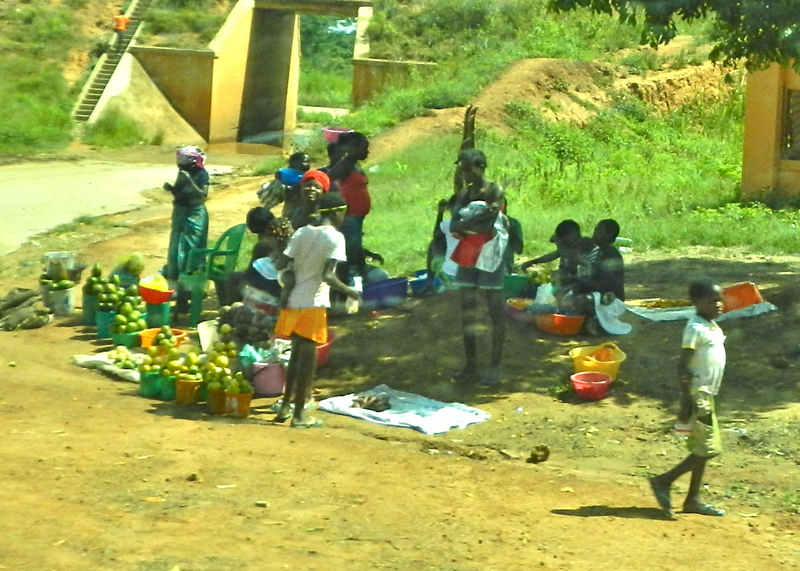 The women work tirelessly selling fruits and veggies, while many of the men relax. We were relieved to find that our hotel was clean and modern, and that they had a record of our reservation – although there were a few tense moments as they struggled to find it. It had been a long day and our drivers and guards all had relatives in the area. We rushed off to dinner so they could have some time to visit with their families after we were done. Dinner at a local cafe was mostly edible, and none of us had any ill-effects during the night, so we counted ourselves lucky. Going to any new restaurant in Angola is a crap shoot (pardon the pun), so our requirements here are much more basic than back in the states. If the food doesn’t make you sick, the restaurant qualifies as five star! 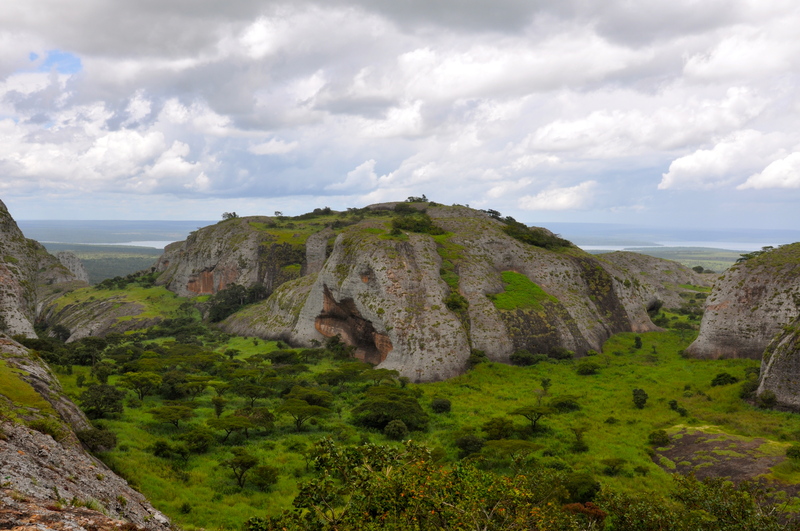 After a restless night, due to the Malarone we were taking to prevent Malaria, we awoke to part two of our trip: a visit to the Piedras Negras du Pungo Andongo, a very unusual geologic formation of enormous conglomerate boulders. The Black Rocks protrude from the lush, green valley as if frozen in time. Not surprisingly, there are many ancient legends as to how they came to be. Piedras Negras as seen from the distance. We parked our cars and hiked up to a small observation point on top of one of the larger boulders. What a view! Piedras Negras with a view of a reservoir formed by the Capanda Dam on the Kwanza river. We were chased back to our cars by a thunderstorm, but managed to get a few photos before we decided that being on top of a bald rock was not the best place to be. 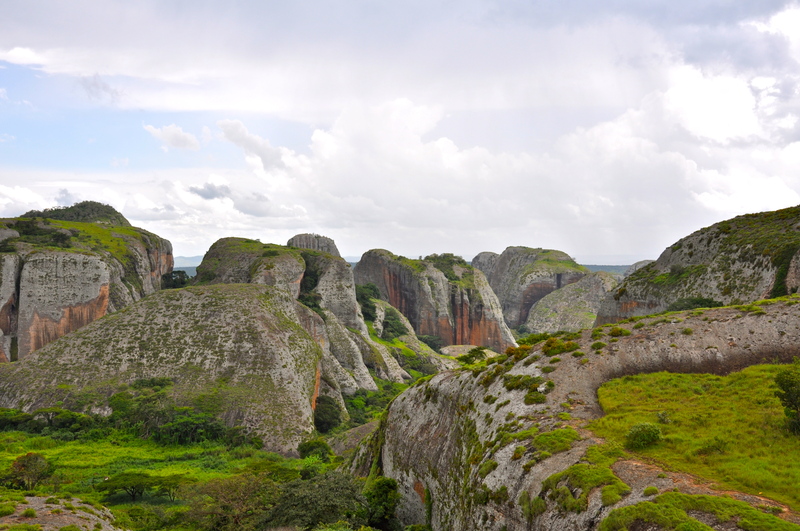 The hike back down was a bit slippery, but the rain cleared in time for a quick lunch before our drive back to Luanda. 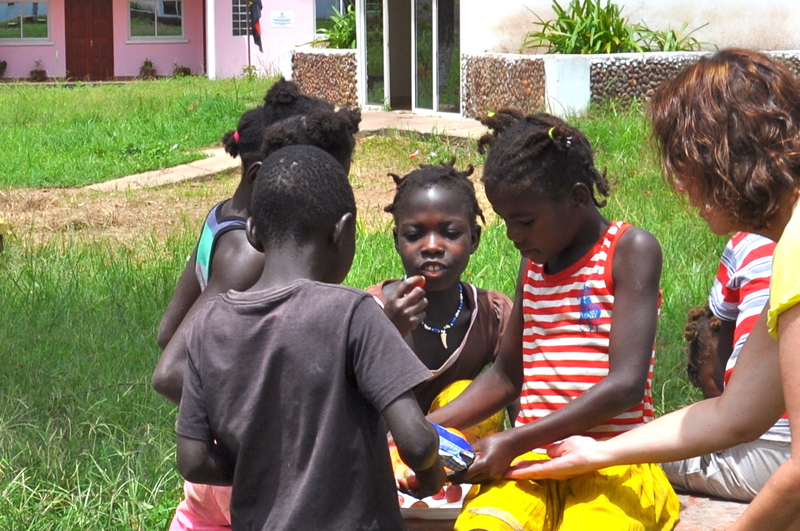 There were two or three small dwellings near the picnic area, and nine local children had some small orange fruits for sale to visitors. Another group of tourists bought the lot before we had a chance to get some, but we did manage to interact with the kids by way of sharing our lunch and offering them some treats. Again, they were very polite and respectful, with the older children guiding their younger siblings to the front to get the treats first. So nice to see! We had passed around individual packets of Oreo cookies, and were amused to see them eat the cream from the middle and leave the outside cookies neatly stacked on the table. 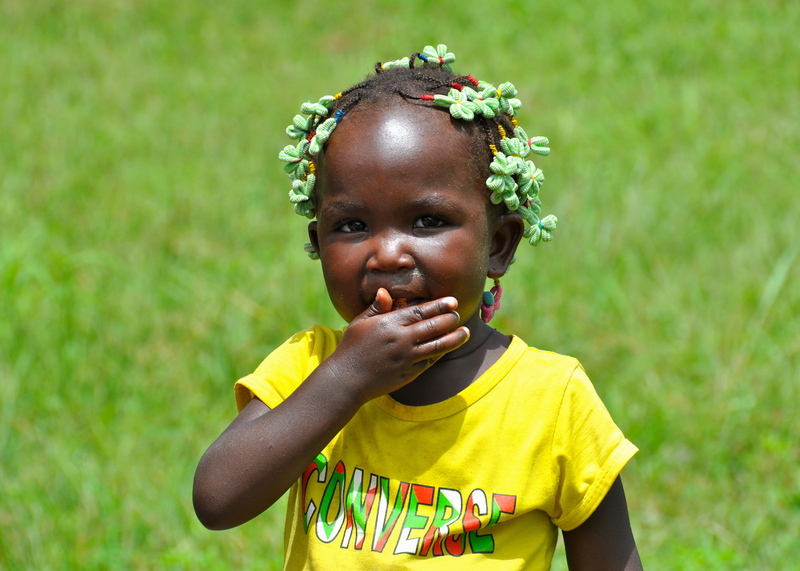 It is doubtful that they had ever tasted Oreos before, as they are rarely available, even in Luanda. Clearly, their tastes run to more natural items. The fruit and veggies were eaten in a flash! The drive back was the fastest and most terrifying of the trip, as the drivers attempted to make it back to city roads before dark. Granted, there are just as many potholes in the city, and they can do just as much damage to a vehicle. However, the roads we were traveling on had the added danger of large trucks avoiding similar potholes, but on the opposite side of the road. This was a game of “chicken” that we all wanted to avoid, especially in the dark. Many of the trucks carry containers which are not tied to the trailer in any way. 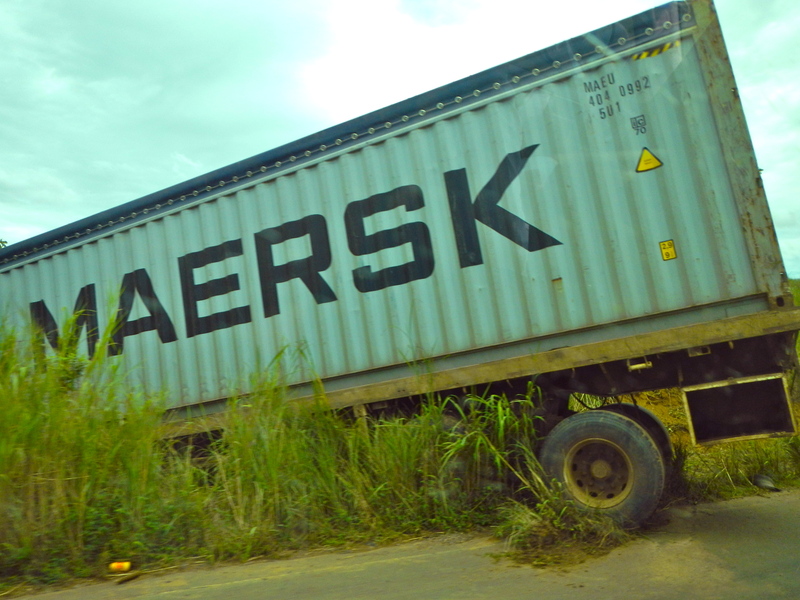 We saw many such containers, both with and without their trailers, laying along the side of the road. One can only guess that the truck driver misjudged a particularly deep pothole and wound up missing his cargo – or worse.